There are many options to choose from when it comes to beauty enhancements. 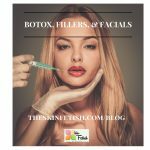 Botox and fillers are services that are popular, however, timing is important when scheduling your facial. Correct sequencing of services will assist in proper, post-care regimens. Botulinum Toxin is an injection that relaxes the muscle under the wrinkles/fine lines to appear smoother. Usually used to minimize frown lines around the forehead and crow’s feet around the eyes. Popular injections are: Botox, Dysport and Xeomin Dermal Filler is a hyaluronic acid that is capable of holding 1,000 times its weight in water. Hyaluronic acid is naturally in our skin located between collagen and elastin. This gives us volume in.